Kula Vineyards is a small, family-owned vineyard and winery located in Templeton, California on California's famed Central Coast. We are located in the El Pomar District of the Paso Robles AVA. We started as grape growers, selling our Syrah to some of Paso Robles' most well-known wineries. We became a winery so we could share our vision of small-production, single vineyard, single varietal wines that fully express the region and vineyard of their origin. We live on the vineyard, which helps us maintain our connection with the grape vines. Every day they speak to us, letting us know what they need to grow and thrive. Later, when it comes time to harvest, we hand-pick and then hand-sort the grapes for all of our wines, using only the best fruit. There's always lots going on at our vineyard and farm. See some of the things that were special to us in 2018. Kula means "Gold" in Hawaiian. From the golden hills that surround us to the Golden Retrievers welcoming you to the property, we are Kula Vineyards! Small production, single vineyard wines. This dry Grenache Blanc was made with hand-picked, hand-sorted grapes and fermented in neutral French oak. With flavors of green apple, pear and honeysuckle, it pairs well with seafood, shellfish and even spicy dishes such as garlic chicken. 100% Grenache Blanc • Seventy-five cases produced. Grown in the El Pomar District of Paso Robles, this special Picpoul Blanc has rich flavors of pineapple, passion fruit, grape fruit and lemon, and has an exceptionally long finish. This rare varietal makes a perfect combination with cured meat, salmon with buttery sauce, shellfish like scallops and clams in creamy sauce, and bouillabaisse. 100% Picpoul Blanc • Twenty-five cases produced. This beautiful pale green-gold Viognier was made with hand-harvested grapes from the El Pomar District in Paso Robles and fermented in neutral French oak barrels. Exhibiting a white wildflower aroma and fruit flavors like lychee, tangerine and apricot, it pairs well with lobster and crab, seafood with creamy sauce, Brie cheese and roasted chicken and vegetables. 94% Viognier, 6% Picpoul Blanc • Fifty cases produced. 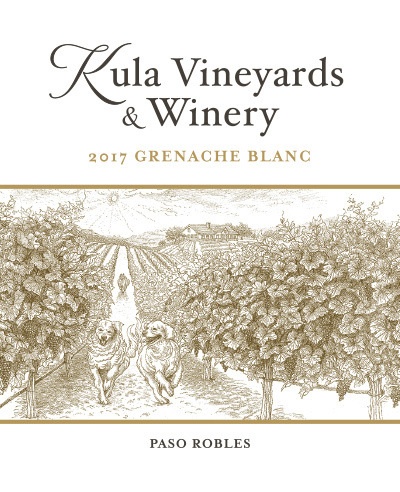 Our 2017 Grenache Blanc shows a clean and elegant nose of green apple, grape fruit and baked lemon. Only hand-harvested grapes from the El Pomar district were used to create this special taste. This rich yet zesty flavor suggests orange peel and lemon bar and pairs well with Brie cheese, crème fraîche, shellfish, ceviche, fish lasagna and chicken sauté. 89% Grenache Blanc, 11% Picpoul Blanc • Seventy-five cases produced. This dry Rosé was made with lovingly-tended estate grapes that were hand-picked and hand-sorted. With flavors of strawberry, citrus and melon, it pairs well with pasta, grilled fish and long summer evenings. Especially bold as a rosé, this wine drinks like a light red. 100% Syrah • Fifty cases produced. Beautiful grapes from our 18-year-old Syrah vines provided a perfect sunset-rose color for our 2017 Estate Syrah Rosé. A hint of Picpoul Blanc was blended to create an excellent flavor of strawberry, lavender and herbs de Provence. Suggested food pairings include goat cheese, Lomo Lomi salmon, grilled sausage and fried chicken. Where the 2016 Rosé was bold and audacious, this 2017 is soft and gentle, with a touch of acidity from the addition of Picpoul Blanc. 90% Syrah, 10% Picpoul Blanc • Seventy-five cases produced. This medium-bodied, rustic red wine has fruit notes of pomegranate and blackberry with spicy undertones of black pepper, thyme and dried herbs. Ideally paried with braised meats and stews, it's a perfect match for beef, lamb or duck dishes. 50% Mourvèdre, 29% Grenache, 17% Syrah, 2% Petite Sirah, 2% Zinfandel • Seventy-five cases produced. Our flagship wine, from our estate vineyard. This wine represents all that we know about growing grapes and making wine. This spectacular 2016 100% Estate Syrah was made with grapes hand-harvested from our 18 year-old vines, hand-sorted and then fermented in 30% new French oak barrels for 22 months. The mouth-filling fruit flavors of blackberry, plum and black cherry provide a long, rich finish. Luxurious and sensuous, this Syrah has spicy undertones of white pepper and pairs well with braised beef, BBQ pulled pork, roasted leg of lamb and aged Gouda cheese. Working from hand-picked, hand-sorted grapes from the El Pomar District, this gorgeous Zinfandel was aged in 30% new French oak barrles for 22 months. With a beautiful, intense color and exceptionally balanced flavors of baked fruit, cacao, vanilla and caramel, our Zinfandel pairs well with BBQ ribs, roast lamb, beef stew and meat slathered in sauce. 100% Zinfandel • Fifty cases produced. No events scheduled. Please check back soon. © 2019 Kula Vineyards, LLC. All Rights Reserved.